Laser scanners are the most familiar type of scanner. They use a laser diode and sensors to read barcodes and are limited to reading linear (1D) codes. 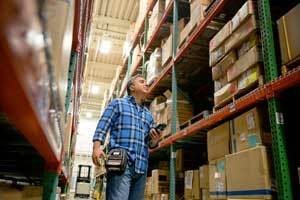 Laser scanners are a strong option when reading barcodes from large distances or on surfaces that are not fully flat. Imager scanners use a camera and onboard computer to scan and decode barcodes. Linear imager scanners are very similar to laser scanners but are better at reading damaged barcodes. 2D area imager scanners can read 1D, 2D and stacked barcodes, and they are able to read a code from any direction or orientation. This makes them faster and more flexible than laser or linear scanners. 2D imagers are also available in “long range” versions and can scan, using reflective labels, up to 30 feet away. Imager scanners can also read barcodes off computer monitors or phone screens. The ubiquitous smartphone camera can be used for occasional scanning but is generally not appropriate for higher volume applications. Be sure to check the types of barcodes you will be scanning and determine the anticipated volumes to be sure you are starting with the right scanning technology. Scanners come in many different form factors, each with its own advantages for specific applications. Handheld scanners are the most familiar types and have the advantage of being portable, light and easy-to-operate. They are frequently wireless models for added convenience and portability. Presentation and in-counter scanners are the types you see in grocery and retail stores. Presentation scanners sit on a countertop and scan codes as they pass by. In-counter scanners are embedded in the counter top and scan codes from underneath. These scanners are fixed and don’t need to be triggered to read a barcode. They are designed to read barcodes from a variety of angles so aiming isn’t as important as it is with a hand-held scanner. Mobile computers combine a scanner and a portable computer in a single device. This combination is ideal for applications like a courier delivery driver as they do not need to be connected to a PC to process information. Mobile computers can store information internally, or more commonly they can wirelessly connect over cellular or WiFi to your enterprise network. They are ideal for applications such as inventory management or mobile workers where data analysis or other applications are required. Fixed scanners are mounted scanners typically used as part of an integrated asset tracking system. They are usually mounted beside a conveyor belt where they scan assets as they pass by the scanner. Fixed scanners can operate at very high speeds to accommodate high-speed assembly lines. Wearable scanner / computers are evolving quickly from wearable devices now widely used for picking inventory to new innovative headset computers like the Zebra HC1. Watch lots of new applications and devices in the wearable space. If you’re going to use your scanner in an industrial environment it’s important to consider potential hazards. Most scanners are designed to withstand occasional bumps and drops, but if your scanner will be exposed to a high risk of physical damage or will be exposed to water, dust or dirt you should look at a ruggedized scanner. An easy way to assess how well a scanner can resist damage is to look at its Ingress Protection (IP) rating and its shock/vibration protection and drop survival specifications. The IP rating measures the scanner’s resistance to dust, water and objects getting inside its casing, and the shock and drop survival ratings indicate how well the scanner withstands physical damage. For example, IP67 means the device is totally protected against dust (that’s the 6) and protected against immersion in water up to 1m (that’s the 7). For applications where the scanner will be operated in extreme cold or hot environments, you should check the scanner’s temperature rating. A typical example is a scanner that is used in freezer and then a warm warehouse. Extreme temperatures can damage the scanner’s electronic components and cause it to fail, or at minimum cause fogging during rapid temperature changes. If the scanner will be operated in cold environments special cold-temperature scanners with screen defrosters, internal heaters and enlarged buttons are available. For gaseous or explosive environments it’s vital to get a scanner that has an intrinsically safe (IS) rating. These scanners are designed so they will not ignite flammable or explosive dust or gas. In addition to the physical characteristics of the scanner you also need to consider your operational requirements. If you’re going to use the scanner for voice communications you should check its audio characteristics to make sure they meet your needs, particularly if the scanner will be used in a high-noise environment. You should also explore audio accessories such as headsets with high-quality noise cancelling technology for example. An important factor with mobile wireless scanners is battery life. Ideally the battery should last as long as the scanner will be in continuous use – say for a 10 hour shift. Check that any existing chargers or power sources match the scanner’s requirements and power levels and be sure to factor the scanner’s charging time into your analysis. If you plan to operate your scanner wirelessly you’ll need to determine what type of wireless network you’ll use. Popular choices include Bluetooth, WiFi and cellular. Bluetooth is used in the majority of scanners and can reach ranges of up to 200 feet from the scanner’s base station, and is ideal for connecting audio accessories and peripherals. WiFi is preferred when operating primarily on the company’s facilities, and cellular-enabled scanners provide wide area coverage if needed. Devices can also be configured to use the most appropriate network available at the time. Finally, your scanner needs to be compatible with the operating system, software platforms and applications you currently use in your business. This is especially important if the scanner is to be integrated into an Enterprise Resource Planning (ERP) system or inventory management system. Make a point of checking the version of the software you are using to ensure they will be compatible with the scanner. You know your business best. A solid understanding of your real-world requirements for a scanner will help you find the right scanner for your needs. With our experience in providing practical, real-world scanner solutions to customers and our in-depth understanding of scanner technology, Nova can help you make the right investment. Contact us today at to learn more.